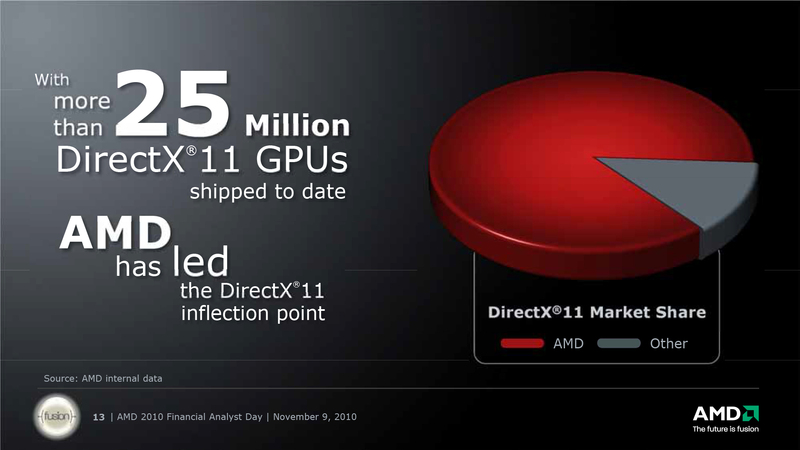 I was analyzing the documents from past AMD conference, “AMD Financial Analyst Day 2010”, which took place on 9th of November and paid close attention to slides indicating AMD discrete GPU market shares. These reports AMD has are based on information provided by analysis agency Mercury Research, which reflects the supply volume but not the actual sales result. That information is not quite comparable to one on AMD slides, since the Steam statistics also includes figures for integrated graphics cards, but the overall picture is clear and it is not in favor of AMD. If you compare Steam data ignoring integrated graphics numbers with AMD data, then about 20% of ATI/AMD discrete graphic cards (lacking percent number to fit 50/50 formula) are still on its way to end-users. 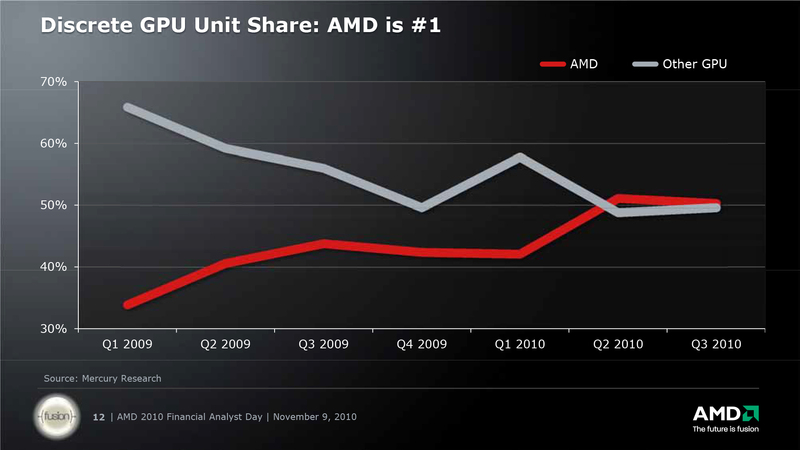 True, Amd products take leading places here — ATI Radeon HD 5700 graphic cards topped the table with a share of 31.88%. Radeon HD 5800 took the second place with interest of 30.66%, followed by GeForce GTX 460 with a share of 7.44%, even less has the GeForce GTX 470 and its 4.99%, GeForce GTX 480 accounts to 4.33%. ATI Radeon HD 5600 has a 3.41% share , ATI Radeon HD 5970 — 2.73%, ATI Radeon HD 5500 — 1.53%, the last with more that 1% share is GeForce GTX 465 — 1.26%. In the end (some models — “Other” — account to mere 0.25%), by simple calculations we find out that 81.78% of Steam users prefer AMD products , NVIDIA shares among DX11-compatible video cards is only 18.02%. At this point Steam statistics reflects close to what AMD data provides. Except for one thing: AMD products are losing ground, while NVIDIA card volume is gradually growing. We will know whether the situation changes with the release of new AMD and NVIDIA products in January 2011. Meantime, fresh Radeon HD 6800 cards and GeForce GTX 580 just began to spread among people, therefore, they have no stats yet. We are also looking forward to expansion of GeForce 5хх series and the announcement of Radeon HD 6900 cards in December 2010.